CT is useful in patients with focal neurologic findings or in atypical cases of suspected HACE. CT can help confirm the diagnosis of stroke, subdural hematoma, subarachnoid hemorrhage, or occult cerebral neoplasm that becomes symptomatic at altitude. Note that no specific changes due to HACE are seen on CT scan. The study is used to exclude other conditions. Head MRI is useful in demonstrating changes specific to HACE, which is indicated by an increased T2 signal in the white matter of the splenium of the corpus callosum. MRI may be helpful in confirming HACE and in evaluating causes of focal neurologic deficits. See the image below. 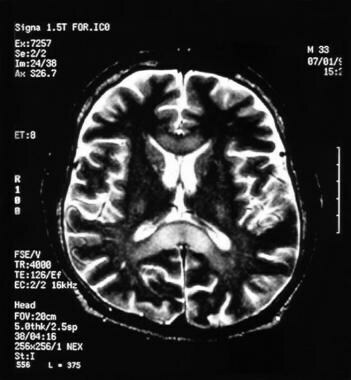 High-altitude cerebral edema (HACE). Image courtesy of Dr Peter Hackett. Pulse oximetry is not helpful in diagnosing or managing AMS and HACE because values do not correlate with severity of illness. It may be helpful, however, in diagnosing HAPE. Chest radiography is indicated if concomitant diagnosis of HAPE is being considered. Fagenholz PJ, Gutman JA, Murray AF, Noble VE, Camargo CA Jr, Harris NS. Evidence for increased intracranial pressure in high altitude pulmonary edema. High Alt Med Biol. 2007 Winter. 8(4):331-6. [Medline]. MacInnis MJ, Wang P, Koehle MS, Rupert JL. The genetics of altitude tolerance: the evidence for inherited susceptibility to acute mountain sickness. J Occup Environ Med. 2011 Feb. 53(2):159-68. [Medline]. Roach RC, Hackett PH, Oelz O, Bärtsch P, Luks AM, MacInnis MJ, et al. The 2018 Lake Louise Acute Mountain Sickness Score. High Alt Med Biol. March 2018. 19:4-6. [Medline]. [Full Text]. Mahesh SP, Mathura JR Jr. Images in clinical medicine. Retinal hemorrhages associated with high altitude. N Engl J Med. 2010 Apr 22. 362(16):1521. [Medline]. Imray C, Wright A, Subudhi A, Roach R. Acute mountain sickness: pathophysiology, prevention, and treatment. Prog Cardiovasc Dis. 2010 May-Jun. 52(6):467-84. [Medline]. Luks AM, McIntosh SE, Grissom CK, Auerbach PS, Rodway GW, Schoene RB. Wilderness Medical Society consensus guidelines for the prevention and treatment of acute altitude illness. Wilderness Environ Med. 2010 Jun. 21(2):146-55. [Medline]. Lipman GS, Kanaan NC, Holck PS, Constance BB, Gertsch JH; PAINS Group. Ibuprofen Prevents Altitude Illness: A Randomized Controlled Trial for Prevention of Altitude Illness With Nonsteroidal Anti-inflammatories. Ann Emerg Med. 2012 Jun. 59(6):484-90. [Medline]. Chow T, Browne V, Heileson HL, et al. Ginkgo biloba and acetazolamide prophylaxis for acute mountain sickness: a randomized, placebo-controlled trial. Arch Intern Med. 2005 Feb 14. 165(3):296-301. [Medline]. Gertsch JH, Basnyat B, Johnson EW, et al. Randomised, double blind, placebo controlled comparison of ginkgo biloba and acetazolamide for prevention of acute mountain sickness among Himalayan trekkers: the prevention of high altitude illness trial (PHAIT). BMJ. 2004 Apr 3. 328(7443):797. [Medline]. Harris NS, Wenzel RP, Thomas SH. High altitude headache: efficacy of acetaminophen vs. ibuprofen in a randomized, controlled trial. J Emerg Med. 2003 May. 24(4):383-7. [Medline]. Shapiro R. Ondansetron for the treatment of nausea associated with altitude sickness. Wilderness Environ Med. 2008 Winter. 19(4):317-8. [Medline]. [Full Text]. Fagenholz PJ, Murray AF, Gutman JA, Findley JK, Harris NS. New-onset anxiety disorders at high altitude. Wilderness Environ Med. 2007 Winter. 18(4):312-6. [Medline]. Partial pressure of inspired oxygen versus altitude. Ultrasonography. Optic nerve sheath diameter measurement. Top of field is cornea, bottom of field reveals retina, then optic nerve in lowest field. Images courtesy of Dr Peter Fagenholz et al. Horse evacuation of nonambulatory altitude illness. Patient in Khumbu, Nepal. Image courtesy of Dr Peter Fagenholz. A very ataxic man with high-altitude cerebral edema (HACE) at 4250 m being assisted toward the Gamow bag. A fully inflated Gamow Bag in use.